From the creator of the Final Destination franchise comes a new tale of death. 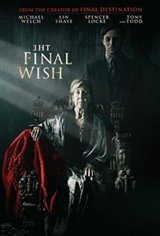 Following the passing of his father, Aaron Hammond (Michael Welch) returns to his hometown to help his devastated mother (Lin Shaye) and to confront his past demons. Shifting through his father's belongings, Aaron comes upon a mysterious item that is far more than it seems.